Water damage is always a problem for wooden fences, no matter what time of year it is. After much research and discussion, you finally chose the new fence you wanted to put in your yard. It’s a wooden one, made of cedar. However, after looking at it every day for several weeks, you may have noticed that it has started to change color. It’s a disquieting grey color. Why did this happen? Let’s find out together. Water damage is always a problem for wooden fences, no matter what time of year it is. That’s because unless there is a heat wave or a drought, rain will always fall. Water will seep into the wooden boards of your fence. Cedar has that fun red look because of a layer of cells on the top. Water breaks down the bonds these cells have with each other and the wood, slowly removing the color. Once the water soaks in deeper, the wood will begin to rot. Rot, mold, and mildew on your fence present a major problem: not only will it damage your curb appeal, but it can become a health hazard to everyone around it. Another problem is sun damage. Yes, the sun can damage your wooden fences. That’s because the effects of UV rays will bleach the color out of the cedar. Sunlight causes the oils in the wood to dry out, which also affects the color of the wood. It’s hard to tell how long this process will take, sometimes weeks, and sometimes years. But there is a solution. Painting and re-staining wooden fences is a great way to protect them against the elements. If your fences have been looking worn down because of the weather, then this is something you can try. However, you need to wait for a few weeks and let cedar dry first before you can apply any staining treatments. If it’s been long enough, though, take a power washer and rinse the gunk off of your fence. You can get rid of the residue making your fence look worse than it is and then you can reseal it. Call Hercules Fence of Norfolk and Virginia Beach for your fencing needs. We have decades of experience in the fencing industry and can offer you the best in ornamental steel, chain link, wooden fences and more. 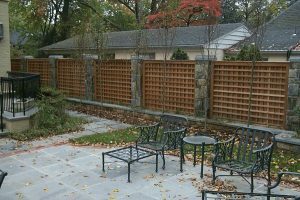 Our dedicated teams of fencing professionals are highly trained, skilled, and experienced in providing quality fence installations of any type. We’ll work with you to find a fence that best suits your needs and budget. Contact Hercules Fence of Virginia Beach at (757) 321-6700, drop in, or contact us on our website to learn more about winter fence construction! You can keep up to date with offers and information from Hercules Fence of Virginia Beach on Facebook, Google+, Pinterest, LinkedIn, and Twitter. This entry was posted on Friday, January 25th, 2019 at 4:15 pm. Both comments and pings are currently closed. Earth Day is Coming! Is Your Fence Ready?